The Samsung Galaxy Note 9's camera has similar 12MP sensors behind the telephoto and wide lenses. It also has a live focus feature that simulates background blur, which also allows you to adjust the blur after you snap a photo. 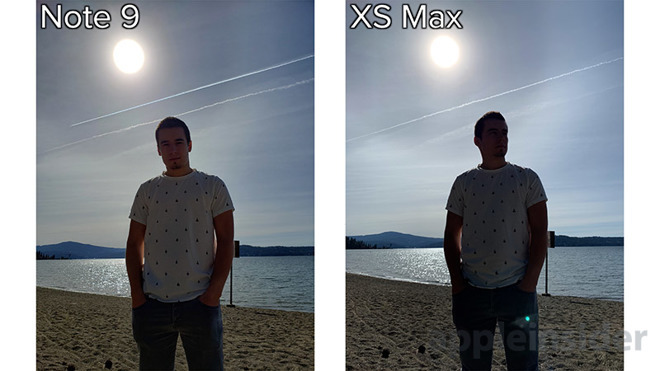 We went out to Coeur d'Alene, Idaho, and snapped a bunch of photos so we could see how Apple's new iPhone XS Max performs against the Note 9. 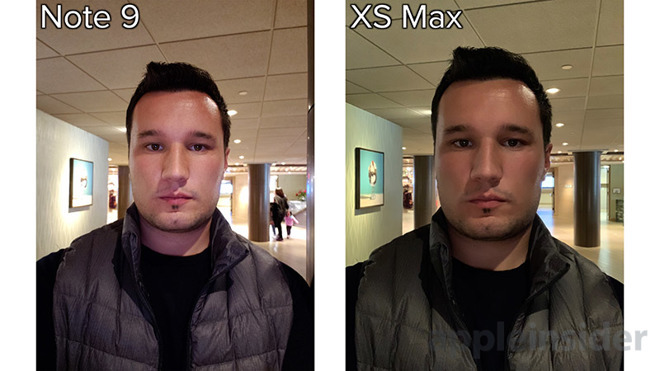 In this first portrait mode shot, you can see how much better the dynamic range is on the iPhone XS Max. 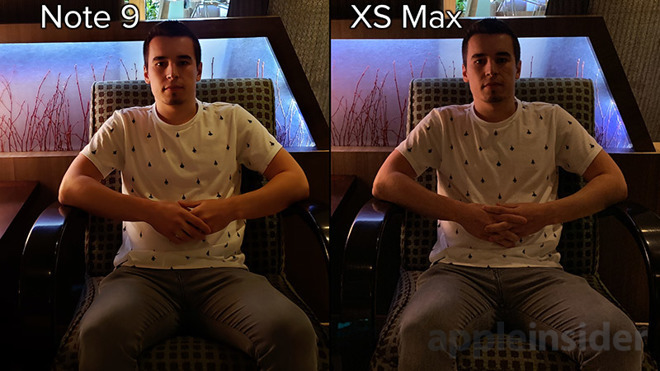 The t-shirt in the Note 9's image is blown out, whereas the XS Max's image is completely balanced. Not only that, but the darkest areas in the shot are brighter on the iPhone. Here, the sky on the Note 9 is overexposed, and there's a huge loss in color. If you take a close look at the buildings in the background, they're blown out as well. However, the Note 9 was able to keep the subject looking brighter and better exposed. We noticed much more saturation on the Note 9's image as well, which is a personal preference, but we prefer the more natural look. Here's where the story changes. When shooting against the sun, the Note 9 does a much better job at dynamic range. The highlights look the same, but the Note 9 is able to keep the darkest areas of the scene looking brighter. There's less lens flare on the Note 9 as well. Now here's a photo of the same scene except using portrait mode. The sunspot on the Note 9 is larger, but it does much better keeping the subject exposed properly. 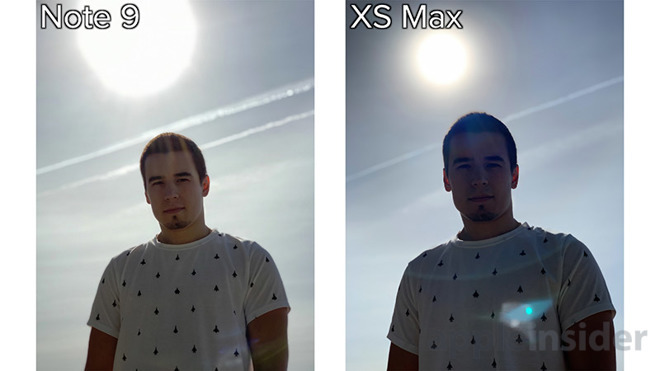 There's a massive flare on the iPhone XS Max's image again. In this shot, the Note 9 has noticeably better dynamic range inside the parking garage. In this portrait mode shot, you'll notice that the XS Max has more blur in the background. You'll also notice that the shirt in the Note 9's image is a bit blown out. 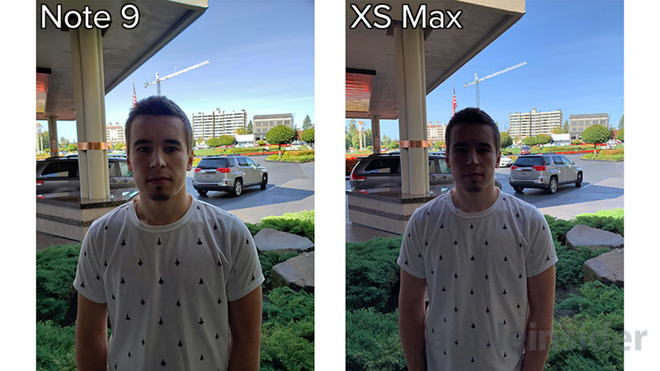 One thing we like about the XS Max's image is that it's more balanced, with a background that is exposed brighter. 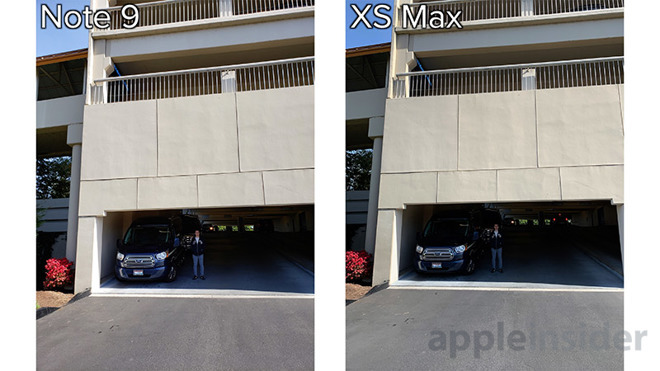 The iPhone XS & XS Max have a new depth control feature, and there's a much wider range of blur adjustment compared to the Note 9. 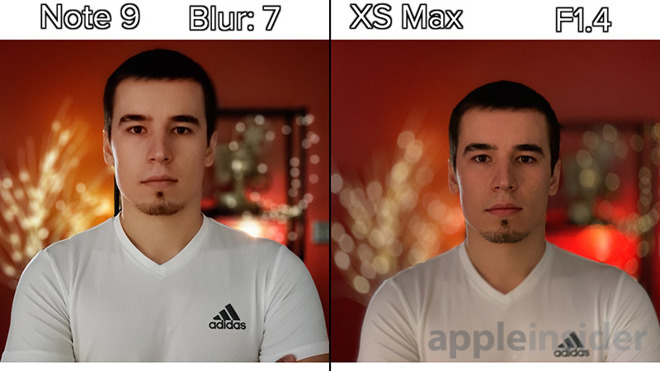 The iPhones can go from a depth setting of F16, all the way to F1.4. The Note 9 can only go from 0-7. The background on the Note 9's Live Focus photos can't get nearly as blurry as they can on the iPhone XS Max, and we think a lot of people would like to have that kind of freedom. When shooting plants, the Note 9 does a much better job. In this photo, the white balance is more accurate and the image looks more pleasing. The XS Max struggles with blur edging, whereas the Note 9 does just fine. In this photo of a flower, the XS Max actually blurs out the whole stem. The Note 9 is able to detect the stem and keep it in the foreground. This is a huge advantage for the Note. 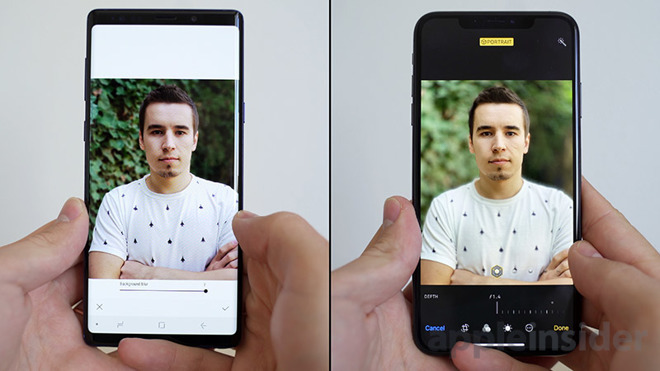 Comparing front-facing portrait modes, the Note 9 is looking a bit soft. 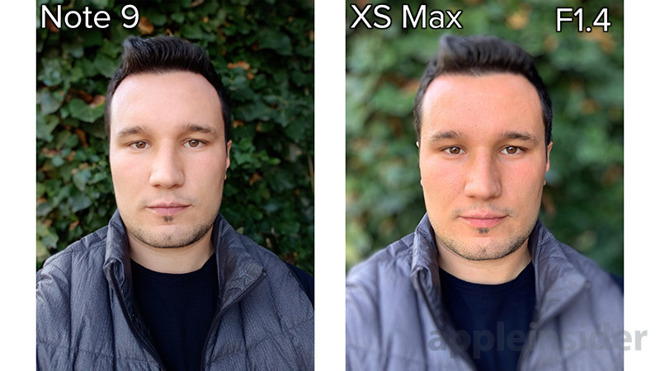 There's much more detail in the face with the XS Max. The background also looks brighter and more balanced on the iPhone. Another perk on the XS Max is that you can adjust the blur on the front-facing portrait shots as well. The Note 9 isn't able to do this. Because of this, the XS Max is able to get portrait photos with incredibly high levels of blur, and it actually turns out quite nice. 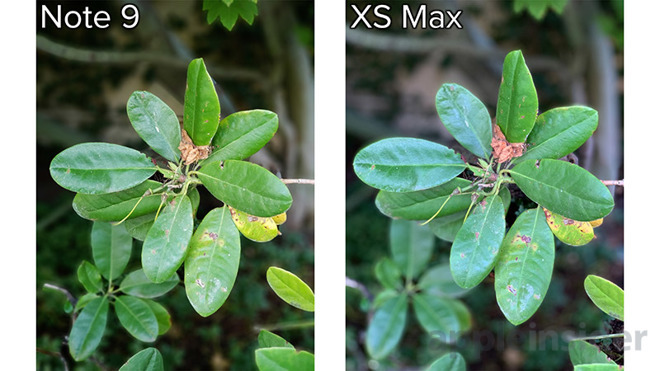 Comparing Portrait mode photos of objects, the iPhone XS Max is getting much better dynamic range. Both phones struggle with blur edging, but the Note 9 is a little bit better. 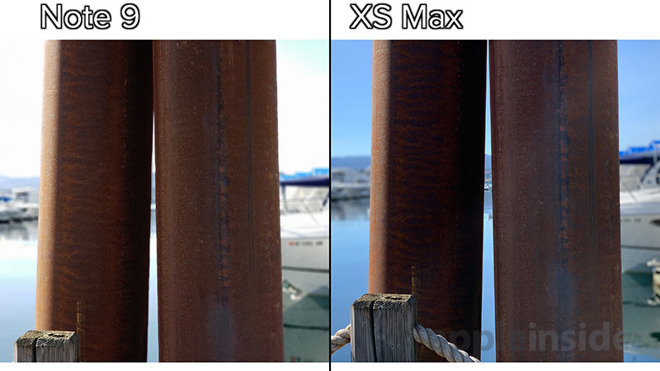 In this photo with a small crease on the inside of two poles, the iPhone XS Max completely fails to detect that it needs to blur the inside of the object. The Note 9 does an almost perfect job at it. However, the dynamic range on the Note 9 is quite bad. Now let's compare detail without using Portrait or Live focus modes. 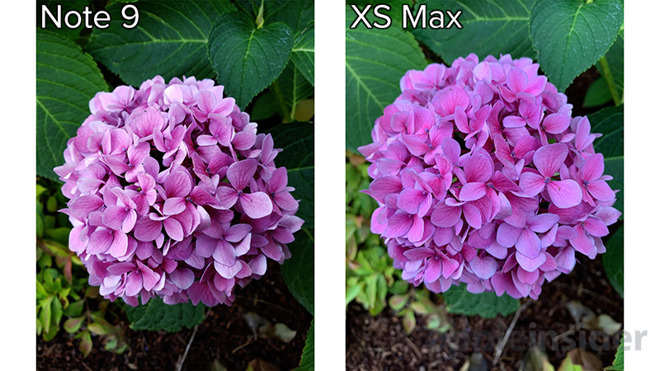 In this shot of a flower, both photos look very detailed, but it seems that the Note 9 either has more contrast or it's more detailed compared to the XS Max. You'll have to decide for yourself which photo you think is better at color reproduction. In this telephoto image of a tree, the Note 9 has more contrast and it has more detail as well. Here's another comparison of detail. 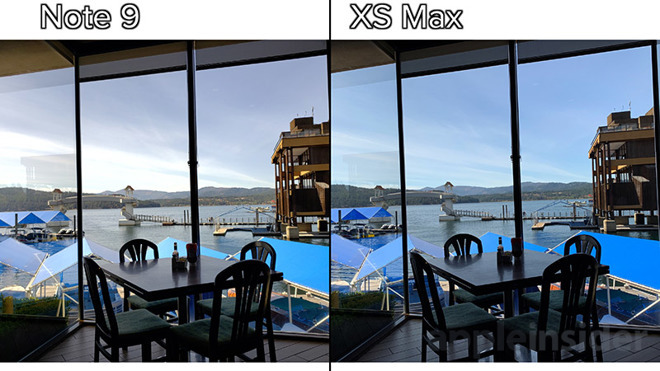 The XS Max has noticeably better dynamic range, and they seem similar in detail. The Note 9 has more contrast and it adds more saturation to the image. 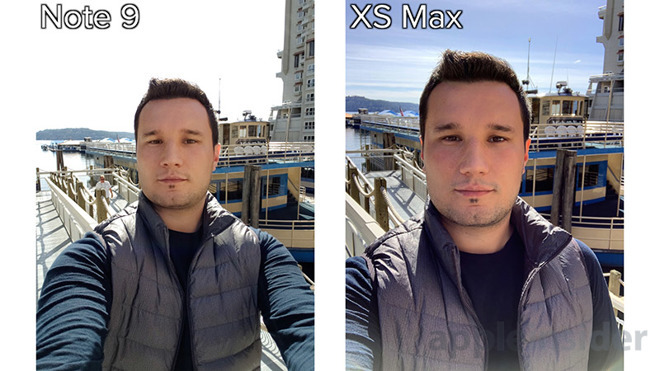 Now comparing regular selfie photos, the difference in dynamic range is shocking. The sky on the Note 9's image is completely blown out. On the XS Max, you can see every single cloud, and the sky is actually blue. At the same time, the face is properly exposed and there's more detail as well. Here's a wide image shot from the inside of a building. There's noticeably better dynamic range on the XS Max, and it's able to accurately reproduce the colors in the sky and background. Moving onto some low light photos, there's a couple of things you'll notice here. First of all, the dynamic range is slightly better on the iPhone, and the white balance is much more accurate. The biggest difference is that the Note 9 adds way too much softening to get rid of the noise. Just look at all of the detail in the pants that is lost on the Note 9. 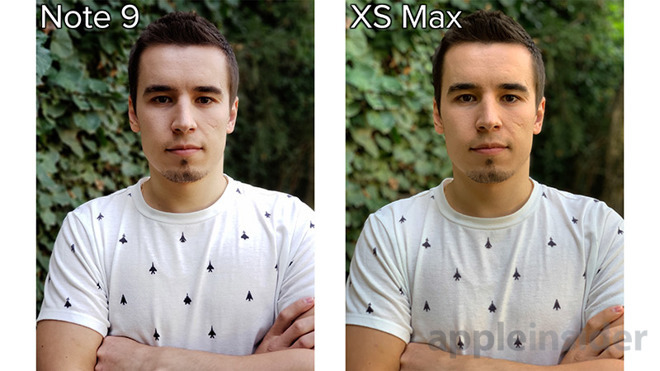 In this portrait & live focus mode comparison. The Note 9 fails to accurately detect the face and ends up blurring it, even after multiple attempts. 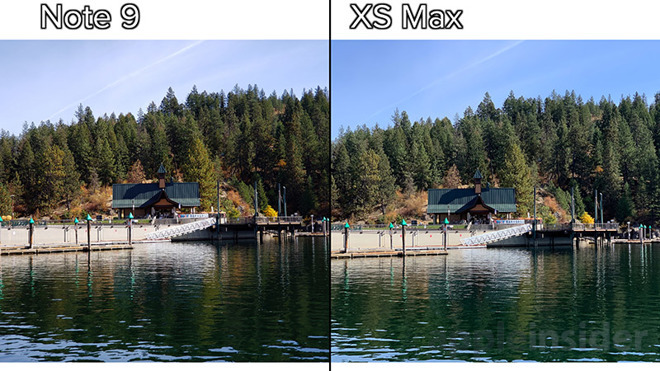 Not only that, but the dynamic range is worlds better on the XS Max. We shot these images with extremely low light. The Note 9 has very impressive noise reduction, making the image look a lot more detailed. 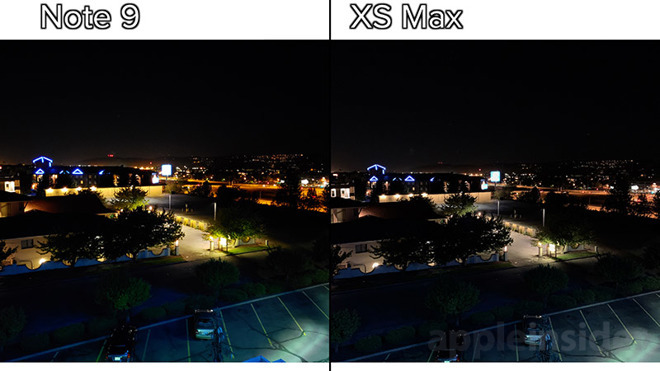 You can easily see more noise with the XS Max. However, the white balance is way off on the Note 9. 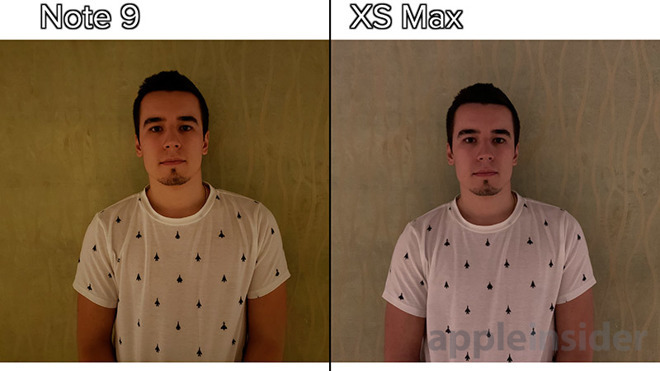 The XS Max was about as accurate as you can get. Now on the front-facing camera, the dynamic range differences were huge. The painting on the Note 9's image was completely blown out. 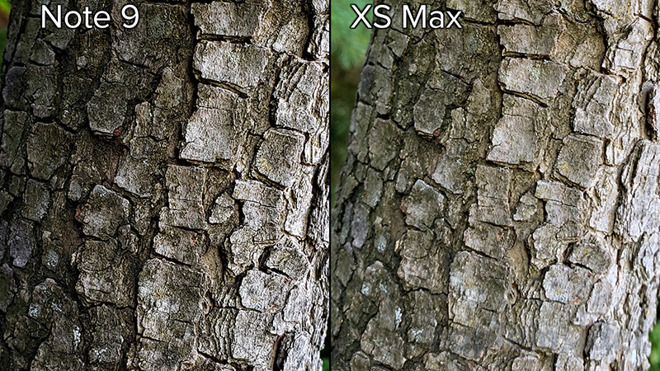 With the iPhone XS Max, you can see every detail. The XS Max was better at white balance as well. Now outside, towards the end of the night, both phones didn't that great of a job with dynamic range, but the iPhone XS Max did a little bit better. The white balance is much better on the iPhone as well, and the Note 9 added way too much saturation. Finally, we have a low light scene with bokeh in the background to compare the portrait & live focus modes. The Note 9 had issues accurately detecting the face and it ended up putting a slight blur over it. The XS Max did a great job with blur edging. 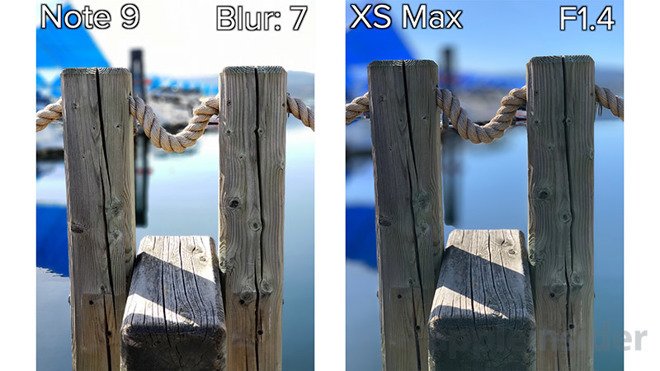 The Note 9 was already at the maximum amount of blur, while the XS Max was at the default F4.5 setting. Now here's where it gets amazing on the iPhone XS Max. We set the depth to the maximum setting of F1.4, and the bokeh really starts to stand out. 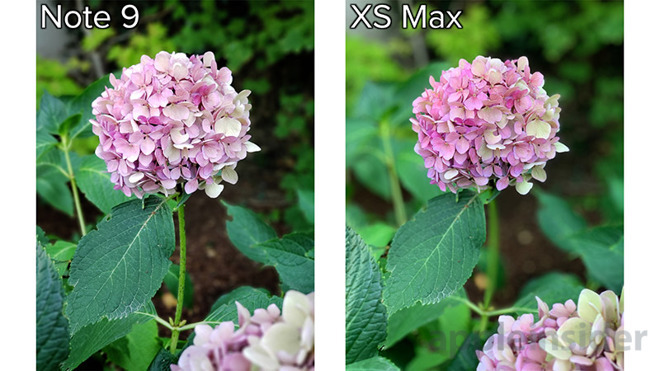 This shows just how much extra blur you can get on the iPhone XS Max, which we think has the potential to convince a lot of customers to go with the XS or XS Max over the Note 9. If you compare the blur on the left and right sides of the iPhone's image, you'll see that they're directionally warped, based on where they're at in the frame. This is something that professional cameras do, and it's nice that Apple added this realistic touch. On the Note 9, the bokeh simply gets larger when you increase the blur, and that's about it. 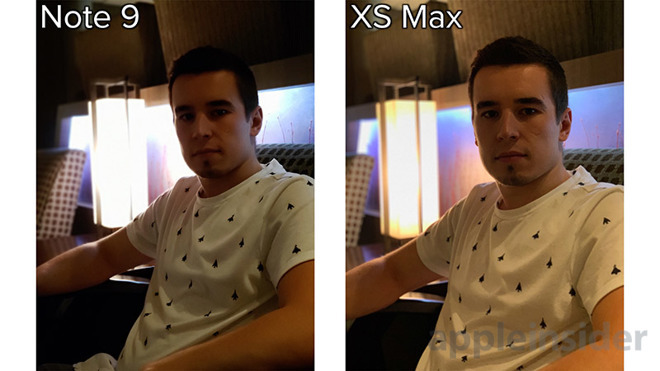 Let us know what you thought about this comparison in the comments, and stay tuned for our iPhone XS Max versus Note 9 video quality comparison, where we'll be testing if Apple's claims of improved video quality are true.